RobVogt80s: The future is now: Remembering “Back to the Future"
The future is now: Remembering “Back to the Future"
for "Back to the Future"
The 21st Century seemed so far away when Marty McFly took Doc Brown in his silver DeLorean to the future, and back again, to the past, and back again. Awhile back, the exact moment in the future that Marty and Doc travelled so far into the future, actually came to pass. A lot was made about how correct some predictions were, and how others were quite off. For me, it just brought back a lot of memories of one movie I liked, that spawned two sequels that at times I have thought would have been better left unmade. There are two things that made me want to see “Back to the Future” when it came to Lethbridge in 1985. One was that Michael J. Fox was playing the lead in it. I had heard about this movie on “Entertainment Tonight”, where they said Eric Stoltz had been originally cast as Marty McFly, but was unable to continue and Fox replaced him. That was due in part to a recommendation by Gary David Goldberg, who was responsible for Fox’s success on the television comedy “Family Ties”. The other was that I heard Huey Lewis and the News were doing the soundtrack. They were already one of my favourite bands, thanks to the influence of my cousin Fred, who played Huey Lewis’ album “Sports” the whole time I visited during the summer of 1984.
played by Michael J. Fox, the two main characters in "Back to the Future"
So, I was primed to see the movie, when I talked to my friend Dave about going to see it. He wanted to go, I wanted to go, and so did a third friend at the time named Craig. I got a lift to Dave’s where Craig already was, and Dave’s mom took us to the College Village Mall, also known as Woolco, to see the movie. They had seen the band Tears for Fears earlier that month, and were still talking about that. They had phoned to see if I wanted to go to that concert, but I was in Brooks visiting my cousin Fred. I was not disappointed in the movie. “Back to the Future” was an awesome movie. It tells the story of Marty McFly, not one of the most popular kids in school, who hangs out with a reclusive scientist named Doc Brown. One day, Marty is thrown back in time 30 years to 1955 by a machine Doc Brown invented. Marty meets his parents as teenagers, and helps them meet, as he struggles to get back to his own time. I absolutely love Michael J. Fox and that perfect blend of physical comedy, great timing, and irony he brings to every role. 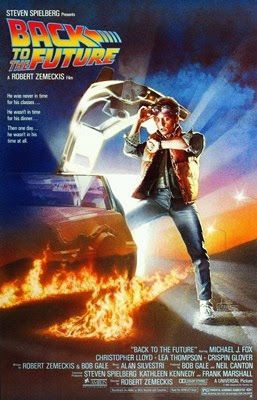 As the hyperkinetic Marty McFly, he carries the movie, but not without solid support from Christopher Lloyd as Doc Brown, Lea Thompson as Marty’s mom, and Crispin Glover as his dad. “Back to the Future” was one of the best movies of the year because it is the perfect blend of comedy, action, and suspense. I sometimes think they should have left it alone. The story would continue with two sequels. “Back to the Future Part II” came out at the end of 1989 and told the story of how Biff, the bully, changed history and not only made a fortune, but altered the future into this dystopic mess. 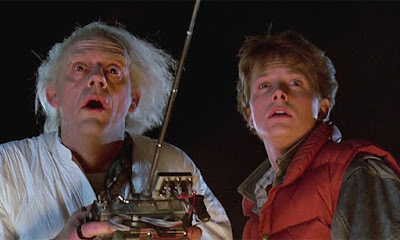 Marty and Doc have to travel to the future, and back again, to fix the damage Biff had done. This is the movie where they postulate what 2015 would look like. When the real-life calendar actually turned to the year 2015 and to the specific day Marty McFly was to have travelled to the future, various observers thought it would be interesting to see how much of what they foretold came true. It really never occurred to me, other than the movie predicted a professional Major League Baseball team in Miami, which has come to pass. A year later, in 1990, “Back to the Future Part III” was released, catapulting Marty and Doc back to the wild west and 1885, where they again change history and have to repair it. I recall hearing or reading somewhere that the producers had made both sequels at the same time, so they could be released relatively close together. Truth is, I probably need to see them both again. When I initially saw them in the theatre, I was intrigued, but I can’t say the first sequel resonated with me. I never really liked Biff even as a villain, or the story line that much. The second sequel was better, and I liked that wild west backdrop, but it seemed like the series had run its course. So, by the end of the three movies I had mixed feelings. It is always fun when time catches up with movies set so far in the future. So it was interesting to see “Back to the Future” commemorated when it actually was 2015. However, that was not part of the original movie, which was strictly a story about travelling back in time. That original movie remains one of my favourites of all time. It told a good story, had great music, and was the right blend of comedy, adventure and suspense. It stands as a classic all on its own. The true test for me is that I would love to see the first one again and again. The sequels? Maybe once to refresh my memory, but they never really stuck with me. Sometimes just because you can make a sequel doesn’t mean you should.